Many animals tell me they reincarnate. 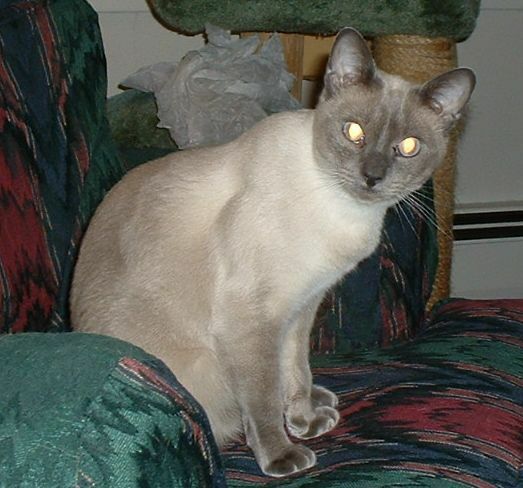 I have lived many lifetimes as a Siamese cat, which is a form I prefer. Whenever I take a physical body, I have specific reasons for what I choose to experience in that life. My last life and this one are closely connected, as you will see from the story. Remember, the cat is in charge. 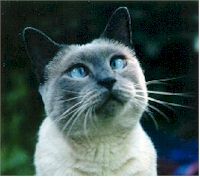 My Siamese friend, Violet, left her body this summer (1998). She exited through her 3rd eye after 10 months of illness. Five days later, Violet visited in spirit form. "We still have a lot of healing work to do together for others and for the Earth," she announced, " I want to be a Siamese again. " A year ago, a client had given me the business card of Reprise Siamese Cattery in Bridgeport. 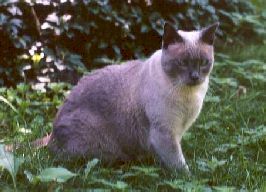 (Reprise Siamese has since moved to Virginia. *) On the card was a picture of two old-style Siamese kittens. I made an appointment right away to visit them. Violet planned to check out the cattery with me. How much could I tell the breeder, I wondered? I proceeded with cat-like caution. Julie Russell and Adele greeted me warmly. We sat among the cats, with Peter, the king, and his queens and babies resting and playing all around us. These cats were full bodied with luxurious coats, and they were all over me with their fearless curiosity. The energy felt warm and loving. Did I dare tell these folks what was going on? We chatted about what an Animal Communicator does, and how I can talk to animals in body and in spirit. Then my hostesses shared a most extraordinary personal story. Adele’s mother had died recently. At the moment of death, Adele was resting while Julie and a hospice nurse were with her mother. The nurse verified the mother’s pulse and respiration, and noted the time of death. The body was straightened and the bedding adjusted so that when Adele came in her mother would look nice. Then Julie brought Adele in to see her mother, who had not breathed at all for the last 20-25 minutes. As soon as Adele sat by the side of the bed, her mother opened her eyes, and took a deep breath. Adele and Julie both saw a golden bright light completely filling the room. The hospice nurse fainted and had to be carried out. While speaking to Adele, her mother took normal breaths. Then she said goodbye, and her body sank back, lifeless. Adele said it was impossible for her mother to have taken any normal breaths because she had died of lung cancer. The golden light remained for the entire time they conversed. This experience had opened both women to spirit in ways they had never thought possible. Now I knew that I could tell Julie and Adele about Violet’s plans. "She’s here in spirit right now checking out the cattery," I said. "We'll talk later, and if she wants to be born here, she’ll tell me." I don’t know what Julie and Adele thought about this, but they didn’t throw me out, so I was encouraged. I described Violet’s dominant, bossy personality. She had taken over my house when she first arrived, had nursed me when I had the flu (barely letting me out of bed to get a cup of tea), and had protected and guarded the house, growling at snow plows. Julie assured me that Siamese females were often powerful personalities. I thought Violet was exceptionally so and that this quality would help them recognize her in a new body. On the drive home, Violet said she liked a young blue-point named Boadicea Blue. I knew which cat she meant. Boadicea had been very affectionate, climbing into my lap, purring, and trying to get into my tote bag. Her energy was a fine vibration, and she was pretty, too. We agreed she’d be the perfect mother for Violet's next incarnation. Over the next few days, Violet decided to be female, and either blue or lilac point. A few days later, I told Julie about Violet's choices. There are no coincidences. Boadicea had just been bred for her first litter. A week later, Violet said there was a waiting list in the spirit realm to get into this cattery. "I’m negotiating to move up in the queue." I never suspected what that would mean..
During the next weeks, I spoke with Violet occasionally. Each time the image I saw appeared to be younger, smaller, more kitten-like. Violet was preparing to return. In my next conversation with Julie, she told me Boadicea was definitely pregnant, the kittens due in late October. It looked like all the pieces were in place. Meanwhile, Echo, my horse now in spirit, told me an old feline friend of mine would be coming back again very soon. When I looked for him at the Humane Society, I met Sakkara, whom I did not recognize. Then I introduced Violet and Sakkara telepathically. Instant recognition! A wave of love and joy passed between them that was so strong it brought tears to my eyes. Sakkara came home a week later. She was about a year old and had already raised a litter of kittens whom she missed very much. She is sweet, loving, gentle, and very nurturing. Two weeks later, I had a message from Julie on my answering machine. "There’s a 8 week old kitten here who is very upset and we’re not sure why. Her mother is Boadicea’s full sister who lives with a friend of ours. We brought her and her siblings to the main cattery on Tuesday. When she got here, she became very upset and has been screaming ever since. She’s also giving her aunts a terrible time. When they try to discipline her, she hisses at them. If they cuff her with a paw to correct her, she stands up to them. Her personality has changed. Instead of a demure female, she’s an alpha cat. Do you think this might be Violet? When we say that name, she stares at us. I think she is trying to tell me something." "This sounds like her." I replied. "Violet always responded to her name. She also hissed at other cats and wouldn’t let me adopt a second one." We arranged a phone session with Adele holding the kitten, whom she described as “a female blue-point, unusually large for her age, with a crick at the end of her tail". Nedda: "Violet, is that you?" Kitten: "Of course it’s me. Come get me." Nedda: "Adele, this is definitely Violet. Violet, I can’t come right away. I wasn’t expecting you so soon and I have to prepare for your arrival." Nedda: "I have to discuss that with Julie. Please calm down and stop screaming at everyone." Nedda: "And they have, and now I know you’re there. So please behave yourself and be nice to everyone. Let Julie and me work this out." To Adele’s and Julie's amazement, the kitten’s demeanor changed as soon as we made the appointment, and changed even more as soon as I began speaking with her telepathically. By the end of our talk, she was completely calm. I told Adele some other things about Violet, how she had used her paws like hands, spreading out her fingers to admire them as if her nails had just been polished. Adele said this kitten used her paws like little hands, too. So many details matched exactly. I was very excited and eager to see this kitten. The following Friday, I drove to the cattery to bring Violet home. According to Adele, Violet spent the entire morning standing on her hind feet looking out through the glass in the screen door as if waiting for someone. On previous days, she had sprawled in the sunshine, but had not tried to look out. When we finally got home, Violet and Sakkara met nose to nose. The kitten who had hissed at every other adult feline did not make a sound. She crouched a bit to say she was just a kitten, showing deference to her older friend. Sakkara proceeded to mother her. Violet's only protests came when Sakkara vigorously washed her face. They immediately ate together, played together, and slept together - feline heaven all around. Per instructions from the cattery’s manual for helping new kittens adjust, I showed Violet where the litter box was several times. She was annoyed, telling me she remembered where everything was and asked me to stop treating her like she had never lived here. It must have been true, because she never made a single error - an unheard of zero adjustment time. Violet decided to keep her name. Her registered name is Reprise Violet Flame. She says, "Having a new body is just like changing clothes. I’m still myself." She still likes steamed broccoli, and wants to share whatever I’m eating. She sleeps under the covers with me, just as before. She only sharpens her claws on a scratching board that lies flat on the ground, not on a vertical one. And her third eye is unusually strong, a beam of energy emanating from her forehead. What’s different? Violet fearlessly jumps and leaps and climbs. In her last life, having been abandoned seriously affected her trust. She was distrustful of all surfaces, even my lap, and would test them carefully before stepping on them. Now her courage to climb and leap is restored. She is also very trusting and affectionate, whereas in her last life she was quite aloof. She has a much louder, more powerful purr, too. Violet is definitely back, happy and healthy and full of joy. What a wondrous miracle! !